While the grown-ups sit down to pumpkin pie and coffee after the Thanksgiving feast, kids will have more fun gobbling up these cute turkey cupcakes. Bake and frost the chocolate cupcakes. Cut a strip of brown cardstock (1 strip for each cupcake) about 1.25 inches wide by 10 inches long. 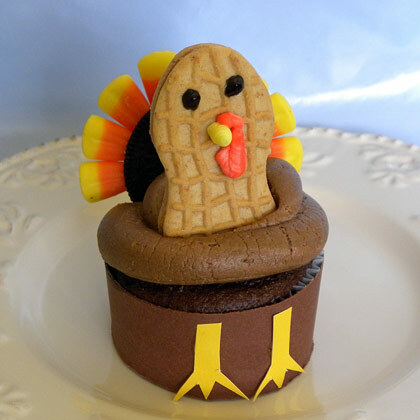 This will wrap around the cupcake to form the turkey's body. Cut 2 turkey feet for each cupcake from the yellow cardstock. To do this, cut legs about 1 inch tall with a triangle at the end. Then, cut out 2 smaller triangles from the triangle base. Glue the legs with feet to the brown base. Wrap the base around the cupcake, taping it into place. Push 8 pieces of candy corn into the Oreo, fanning out over 2/3 of the Oreo. Add a beak, eyes and a gobbler to the Nutter Butter cookie with the colored icings. Press the decorated Nutter Butter cookie into the frosting on top of the cupcake with the Oreo behind it.